Early organizers saw the positive impact the first Elkhart Lake races had on the local economy and decided to do something about it. 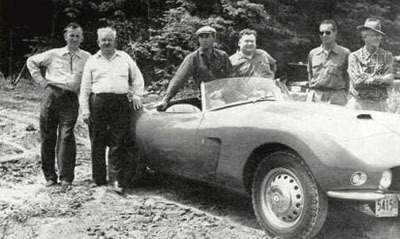 The SCCA and the race committee probably realized by 1951 that racing on public roads could not continue for much long. Homeowners had limited access to roads closed during races, and there was the obvious inherent danger of open road racing. 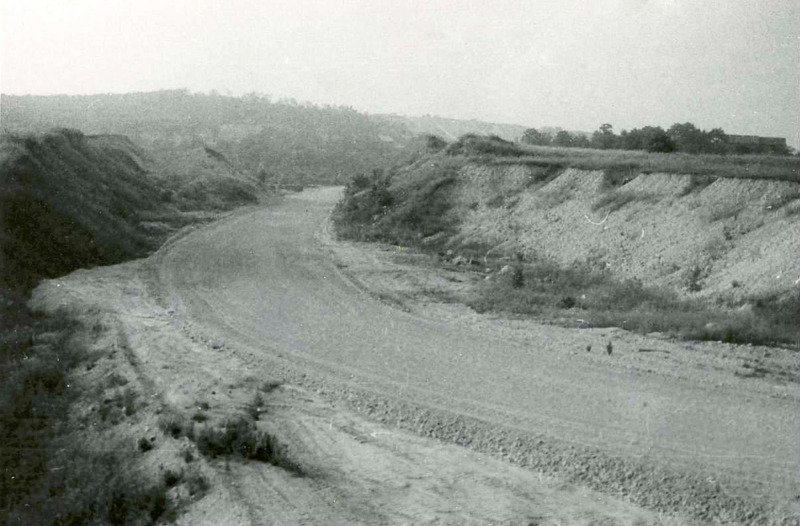 In March 1952, tentative plans were made for a closed circuit on a 635-acre area north of the village boundary. But, there were too many challenges with acquiring the land needed from many different owners. The proximity of the site was too close to the village and the back yards of some homeowners. The plan to build a closed circuit north of the Village of Elkhart Lake was quietly abandoned by the middle of 1954. In spite of all this, a new plan came forth through the efforts of one individual - Clif Tufte. 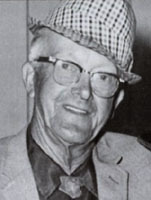 Tufte was a civil engineer, president of the Elkhart Sand and Gravel Co. and a racing enthusiast whose company owned 523 acres of nearby virgin land. He visualized the building of a permanent road circuit and organized many influential citizens in Sheboygan County along with leaders from the Chicago Region SCCA. A World War I veteran, Clif Tufte served with the Army Corps of Engineers then worked for state highway commissions. In 1929, the Elkhart Lake Sand and Gravel Company, a major supplier of highway and railroad ballast in eastern Wisconsin, hired him. By 1950, he was major shareholder and company president. But, business began failing when demand for sand and gravel dropped off. The company's one major asset was 520 acres of mostly virgin land. The site was located two-miles south of Elkhart Lake on State Trunk Highway 57 (now STH 67) in Section 4 of the Township of Plymouth. It was mostly open farmland with a few isolated wooded areas and included an abandoned gravel pit. The property is bounded on the north and east by STH-67, CTH-J on the south, and the Milwaukee/St. Paul railroad on its west. Clif and the property, both provided the alternative the race committee had been seeking. He also had a vision for the configuration of a racecourse on the land. His plan took hold with the race committee and planning got underway for a new racing facility. To get support from the SCCA and Tufte invited officers to come and inspect the property. The group liked it so much; they agreed to sanction a national road race in if, and when, the course was completed. 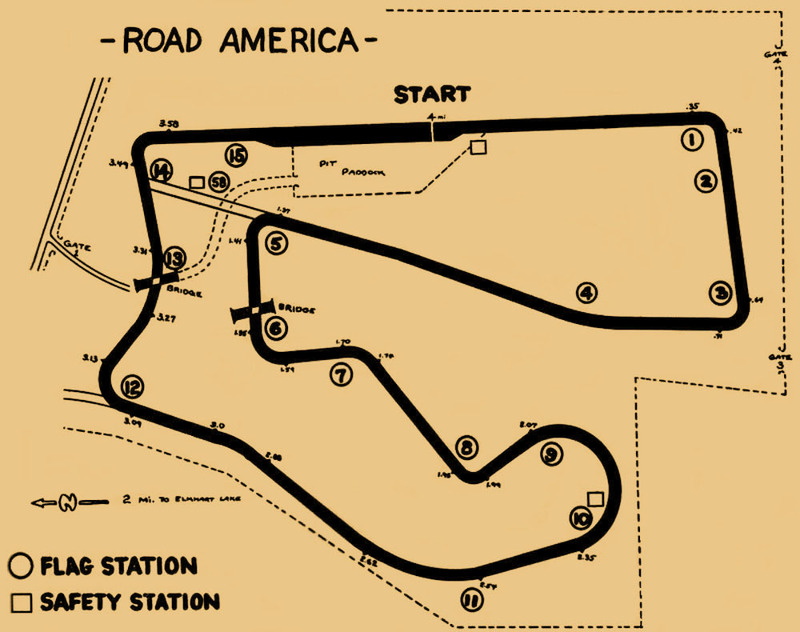 In October 1954, Road America, Inc. was formed and stocks were sold. The members of the Chicago Region SCCA largely financed the project, which Clif Tuft was spear heading. In early January 1955, a prospectus was printed for investors with an itemization of the amount of capital needed. The amount was raised by selling 1,750 shares of stock for $100.00 a share, and sold in blocks of five shares. The concept of Road America virtually sold itself. People throughout the area and beyond were invited to attend a Road America informational meeting held on January 20, 1955. The SCCA agreed to sanction a national race at the track for September 9-11, 1955. Before stock certificates could be issued, $75,000 would have to be pledged and in the bank before construction could start. Over 100 people attended the meeting and $24,000 was pledged. By mid March the amount pledged was $70,000, even though it was short by $5,000, work was already being done to the track. In order to get things started before the spring thaw, Clif Tufte asked a local student majoring in Civil Engineering and friends, to do surveying and construction staking of the course. Most of the work was done on weekends in March and April. Tufte first walked the land laying out the track in his mind. 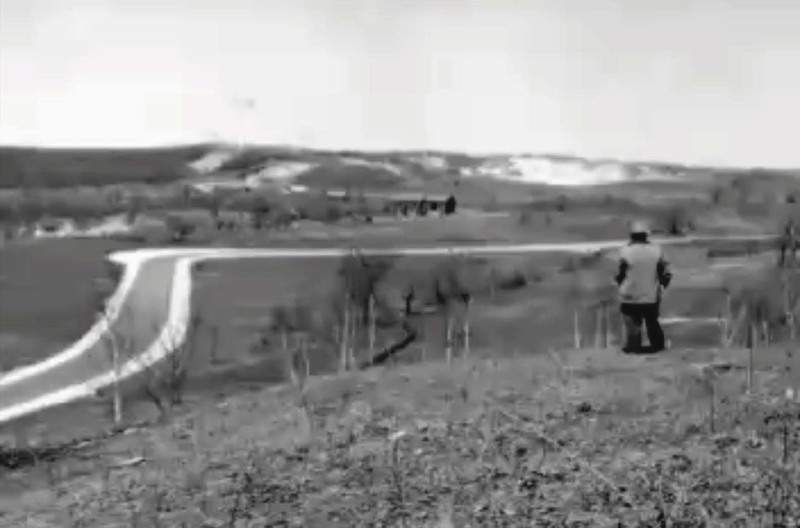 He drove around area roads in the Wisconsin countryside to gather ideas; then noted and measured the turns and bends he wanted to incorporate into his track. On April 20, 1955, Road America, Inc. had the $75,000 needed to issue stock certificates. Road America's stockholders met to elect officers and directors. In April, a bulldozer broke ground and grading on the four-mile road course began. By the end of June, all but the downhill section going into Turn 5 had been graded. Soon after, the crew could begin asphalt paving. Clif Tufte's dream became reality in just five short months. 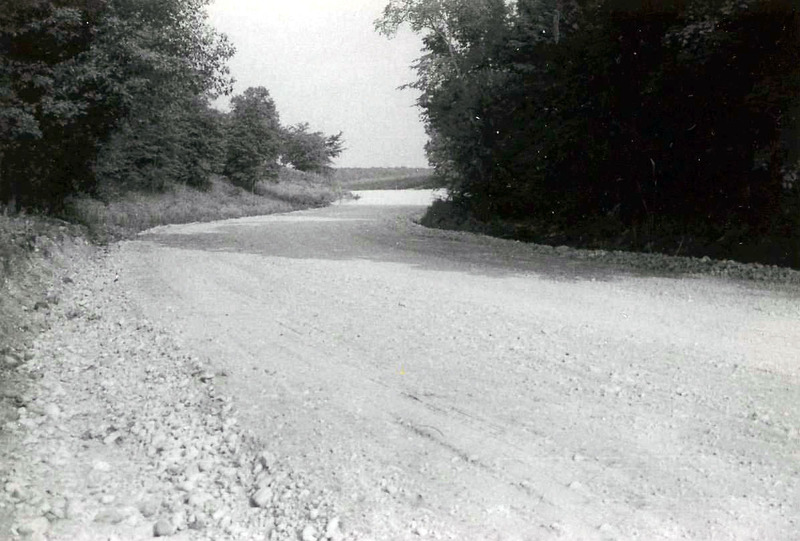 America's roads gave birth to sports car racing in the U.S. Fittingly, the track was named Road America. Tufte also built the track's race program, which was only scheduled around three weekends in June, July and September. His June Sprints, with more than 500 entries, formed the top amateur-racing program in this country. It all happened in Wisconsin's backyard. "America's Dairyland," had also become a world-renowned race land. Above is an overlay of Road America's 4-mile track onto a 1941 Sheboygan Co. atlas showing Section 4 of Plymouth Township. Clif Tufte was also president of Elkhart Lake Sand & Gravel Co., which already owned a majority of the land. 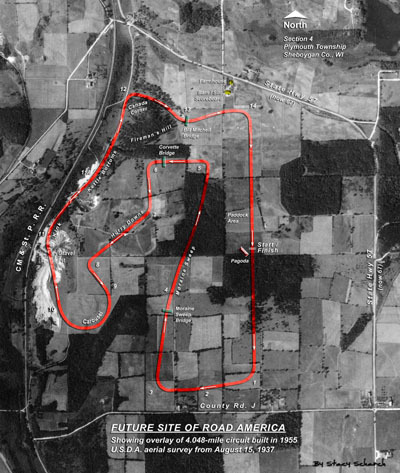 The highlighted area on the map (above) represents land acquired by Road America, Inc. in 1954. The majority of property had already been owned in 1941 by the Elkhart Lake Sand & Gravel Co., of which Clif Tufte was President. Road America is more or less bounded by former STH 57 (now 67), CTH-J and a railway. The site contained mostly farmland, wooded areas, with abandoned gravel and lime pits on the western edge of the property. 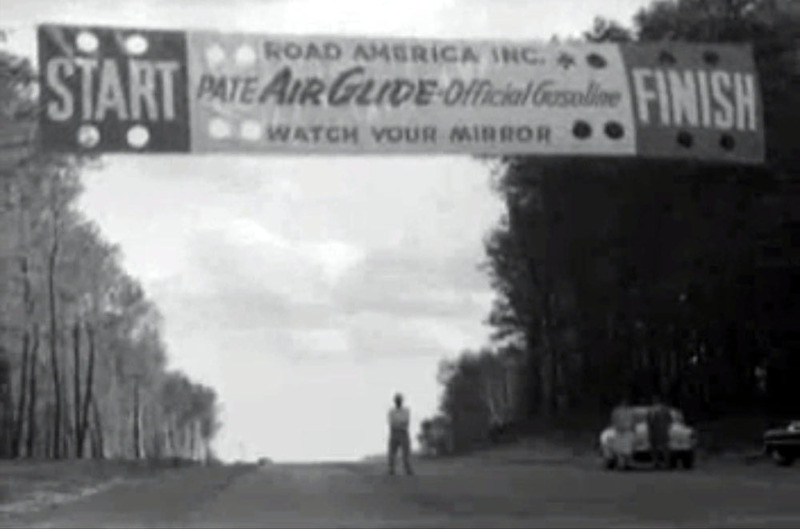 The track opened in 1955 just two-miles south of the former Elkhart Lake circuit. A smaller eastern parcel was added in the 1990s. Today, Elkhart Lake's Road America, Inc. is said to total about 640-acres. Aerial photo from August 15, 1937 of virgin land, eighteen-years before the 4-mile private road circuit was built. The future Road America site is bordered by the railway, State Hwy. 57 (now 67) and County Hwy. J. The mining pit belonging to Elkhart Lake Sand and Gravel Co. is alongside the railroad corridor. In 1937, the US Department of Agriculture began their aerial photographic survey over the entire state of Wisconsin. The aerial photo (above) shows undeveloped land south of Elkhart Lake, WI, primarily in Section 4 of Plymouth Township, Sheboygan County, WI. 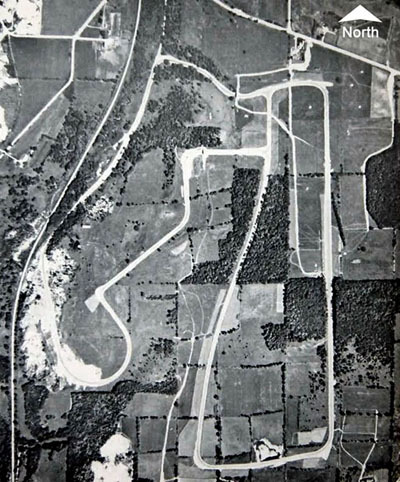 The aerial photo (above) was taken on August 15, 1937, nearly eighteen years before Clif Tufte realized his dream of building a world-class road racing facility. The future Road America site is bordered by the railway, State Hwy. 57 (now 67) and County Hwy. J. You can see the Elkhart Lake Sand and Gravel Co. mining operation along the railway corridor. The company moved into the area before 1920. I superimposed the 4-mile track to scale with the image, which gives an idea of the amount of land clearing needed to make way for the 27-foot wide paved road course. 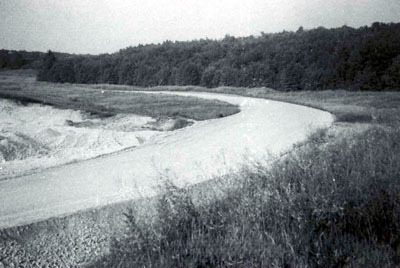 The western stretch of the track is called Kettle Bottoms and follows the natural topography, and the sweep of the Chicago, Milwaukee and St. Paul railroad. The Wisconsin Historic Aerial Image Finder provides free online access to over 38,000 aerial photographs of Wisconsin from 1937-41. These photographs were originally acquired by the US Department of Agriculture. As part of a three-year project funded by the Ira and Ineva Reilly Baldwin Wisconsin Idea Endowment at the University of Wisconsin-Madison, these photographs were scanned, indexed, and made web-accessible through a map-based interface. These photographs are available for download by any user without fee or use restrictions. Collaborators on the Wisconsin Historic Aerial Image Finder project include the Wisconsin State Cartographer’s Office, The Arthur H. Robinson Map Library, the University of Wisconsin Digital Collections Center, and the Wisconsin Department of Transportation. 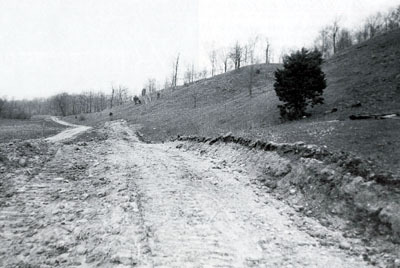 Looking northeast in April 1955, a bulldozer has just broken ground on the stretch known as the Kettle Bottoms from the gravel pit heading toward Turn 12. The railway is to left out of view and parallels the old dirt road where track will run. 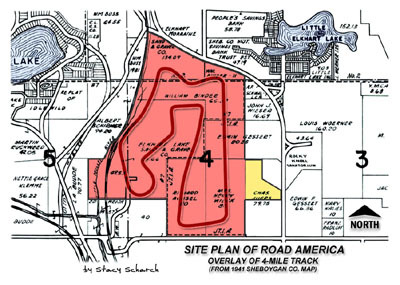 Shortly before Road America, Inc. was formed and before any ground was broken, the Chicago Region SCCA inspected the undeveloped site with Clif Tufte in late 1954. They saw his vision for the track and liked it so much, the sports car club agreed to hold a national race as soon as the track was completed in 1955. 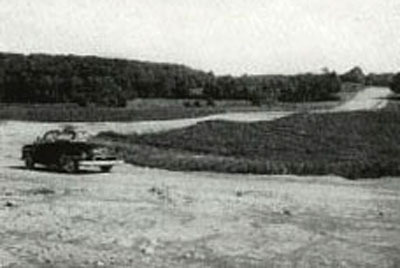 Track grading at the entrance to the Carousel at Turn 9 looking northeast (upstream) toward T 8 Hurry Downs, about June 1955. The Carousel (looking northwest) in April 1955 when construction started. 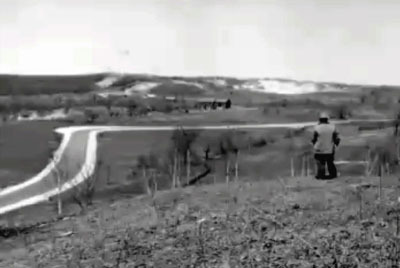 Clif Tufte and another engineer inspect the grading and gravel base of the sweeping high-speed half circle curve called the Carousel, between Turns 9 and 10. 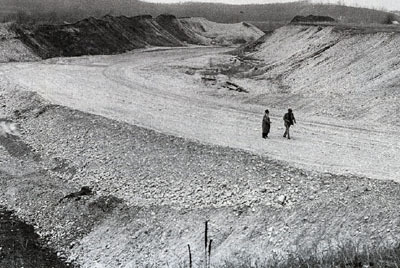 Tufte sold the Elkhart Lake Sand and Gravel Co.'s property and abandoned gravel pit. 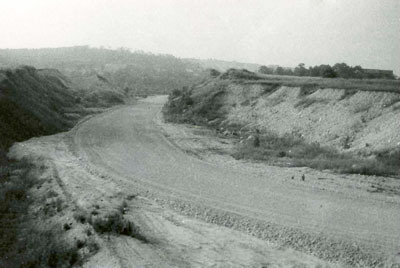 Grading around June 1955 at the exit of Carousel's Turn 10 looking north toward Turn 11. The graded course through Elkhart Lake Sand and Gravel Co.'s gravel pit. The Carousel cuts through the old gravel pit in the southwest corner of the track property. The Wisconsin Kettle Moraine is an area stretching from Green Bay southwest to Madison and is rich in glacial deposits. Elkhart Lake is one of the largest kettles created from buried glacial ice. 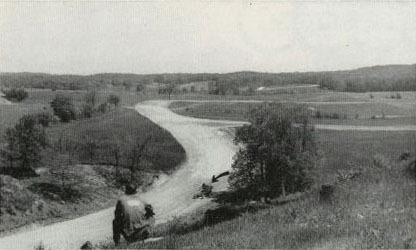 The site of Road America contains plenty of road material for building the world-class road circuit. The track took just five-months to build, from ground breaking to green flag for the first race. The Chicago Region SCCA hosted a national race on September 9-11, 1955. Thunder Valley (looking east) from Canada Corner (Turn 12) toward left bend beyond (Turn 13). The gravel base is down and ready for blacktop. A car on the gravel base at Turn 14. In the background is the hill going up the front straight toward the start/finish line, where the Pagoda was built. Halfway up the hill is the exit lane into the pits. 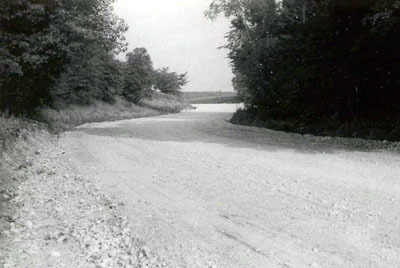 Taken in June 1955 before paving began. (ABOVE) View looking east from Fireman's Hill at turn 13. The road in the middle (going to right) is the link for the shorter course, which connects to corner 5 and shortens the track to only 6-turns. Turn 14 is beyond the link, which also goes right and is the last corner before the finish line. Construction crews and race organizers must have felt the timeline with just three months left before the green flag drops for Road America's first race. Still no pavement or was the T 13 crossover bridge started. Hillside view looking northwest from outside the Carousel at T 9 and upstream at T 8 in the middle. Cars will enter this segment of track from the right, coming down a gentle grade called Hurry Downs, into T 8 turning toward camera, and into the Carousel at T 9 off to left. View looking south down main straight, before start of first race on September 10, 1955. One final glance, Clif Tufte is standing on the start-finish line, staring down centerline of track. From bulldozer to green flag, who wouldn't feel the sense of accomplishment after building a world-class racetrack in just five-months. A promotional film presented by D. W. Onan & Sons, Inc.
Aerial photo of Road America taken about 1956, roughly one-year after it opened. Missing is the crossover at mid-point of the Moraine Sweep (back-straight) near Turn 4. Both bridges at turn 6 and 13 are up. Only one or two concession stands are up, of about 11 or so originals built of concrete block. 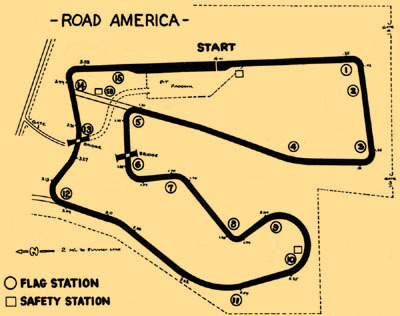 One of Road America's first track maps used in a 1958 Official Program. 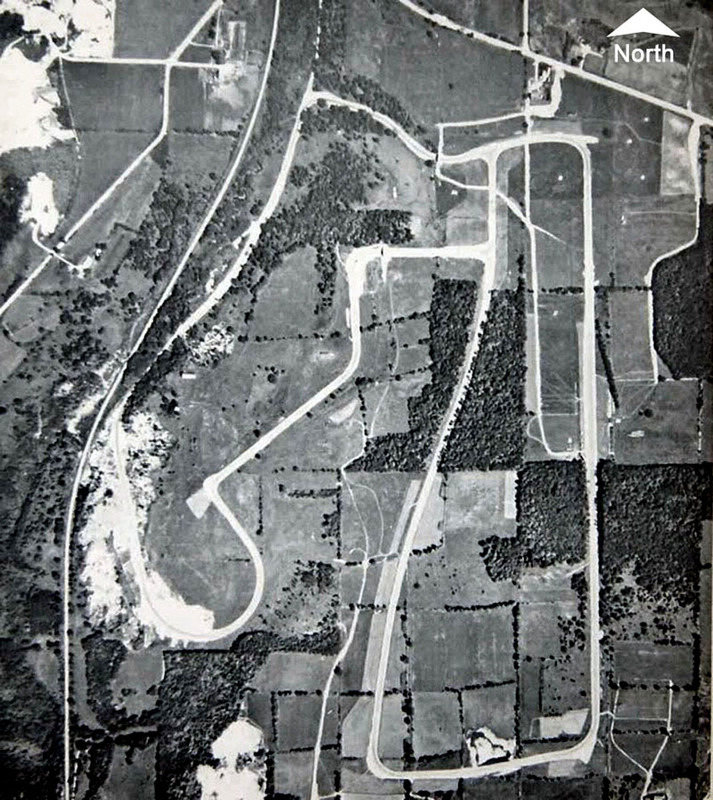 Aerial view of the Road America in 1965 (looking east) when it was ten-years old. The 1965 aerial photo (above) of the track is looking east at the railroad and dogleg with the Kettle Bottoms and Kink sections. The property contains about 640 acres of hilly terrain with 150-feet of changing elevation on the 4-mile road course. 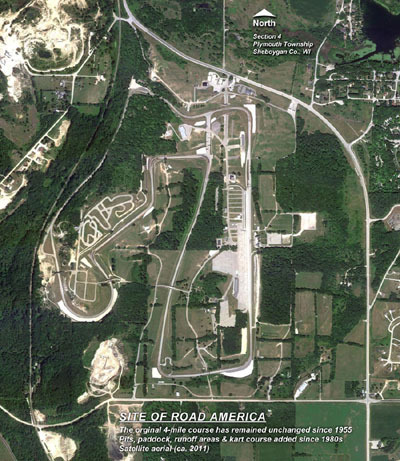 This satellite image of Road America was taken about 2011. 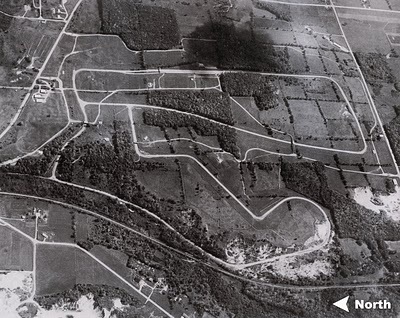 The road course has virtually remained unchanged since it was built in 1955. Over the years, many improvements have taken place to the overall facility. Road America's facility continues to evolve and has seen many improvements and updates over the years. Many of the changes began in the mid-1980s. They include a new race control VIP/Media Center, built across the track from the original Pagoda. This allowed the pits to be doubled in size. The competition paddock was enlarged and more areas paved for race teams and their cars. The original course configuration has remained unchanged except for a new bend for motorcycles near the Kink at Turn 11. Corner runoff areas were greatly enlarged and gravel traps added. Guardrail and barrier walls were set back further from track edge and debris containment fencing was added to much of the course to protect spectators and drivers. Other hazards like trees, as well as a dangerous bridge at Turn 13 were removed. Some of the original pedestrian/traffic crossovers were replaced and new ones added, along with three new tunnels for pedestrians and traffic in more recent years. Two new bridges were added in the Carousel for traffic at turn 9 with a pedestrian crossover at turn 10. Three new cross under tunnels were added. During the winter of 2006, a $1.5 million capital improvement project began and included removing the old Bill Mitchell Bridge at turn 13 and replacing it with a new traffic/pedestrian tunnel near turn 14. A pedestrian tunnel was added, which crosses under the track allowing access from the pit and paddock area to the new race control building near Start/Finish. Also, a first class kart-racing course was added along the Hurry Downs between turns 7-8. The circuit has essentially remained unchanged from Clif Tufte's original configuration as built in 1955. David Hobbs, Brian Redman and other notables.